The Competition was born of the need to sustain familiarity with the music of Fryderyk Chopin and to perpetuate the piano playing tradition that was characteristic of his style. Today, when the Competition is organised on such a huge scale, attracting the greatest pianistic talents from all the countries of the world, and Chopin’s music is enjoying the kind of popularity and recognition afforded virtually no other composer, it is hard to believe that after the First World War, just ninety years or so ago, Chopin’s works were being played increasingly rarely and were disappearing from music school curricula. The Chopin cult was dying. The idea for creating the Competition came from the teacher and pianist Jerzy Zurawlew. Working with young people, he observed their keenness for rivalry and for displaying their talents, so he considered that a pianistic tournament would be the best way of encouraging them to play Chopin. At that time, implementing such an idea was by no means straightforward, and for years the Warsaw Competition was the only event of its kind in the world. Besides the promotion of Chopin’s music, the other crucial and enduring idea nurtured by the organisers of the Competition was the desire to eradicate from concert practice the commonplace "embellishing" of Chopin’s works. Prior to the first Competition, the weekly Swiat announced: "One of the biggest cultural celebrations that we have experienced in Warsaw since the rise of the free Homeland. […] Standing in the lists are young performers, pianists from all the countries of Europe. In the noble spirit of emulation, they are to vie for the palm in the perpetuation of the Chopin tradition. Hence this tournament is to some degree not just a revue of pianistic technique or of the musical culture of particular countries, but also a test of the Master’s finest historical style". Among those who contributed in no small way to the performance style that concerned the first organisers of the Chopin Competition were some of the composer’s pupils (both his actual pupils and also a number of pianists who dubbed themselves such after the composer’s death). "Those early relayers of Chopin’s style – in the opinion of Jerzy Waldorff – began playing hysterical Etudes and Preludes with rubato, grace notes in the left hand and arpeggiated chords. They blurred the Nocturnes with a superfluity of pedal, and in the Polonaises they thundered at the keys to the point of ruining the strings, which was supposed to denote sympathy – prepared for heroic deeds – with Poland shackled in chains". 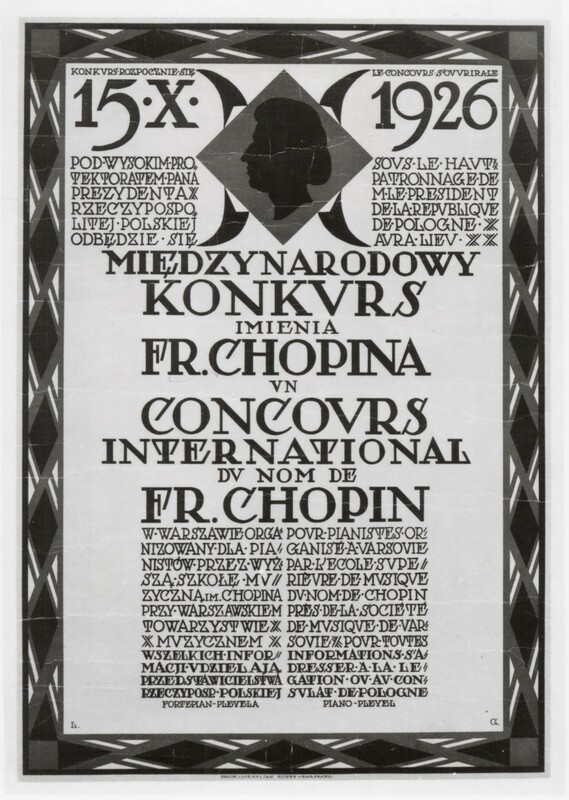 Picture: Poster of the 1st International Fryderyk Chopin Piano Competition in Warsaw, by Ludwik Gardowski, with the date 1926. In the first edition of the Competition, held in the winter of 1927, only twenty-six pianists from eight countries took part. Those arriving from outside Warsaw stayed and practised in the private homes of families who had agreed to put them up. The jury – bar one – comprised solely Polish artists. The podium was taken by Russians (including the winner, Lev Oborin) and Poles. 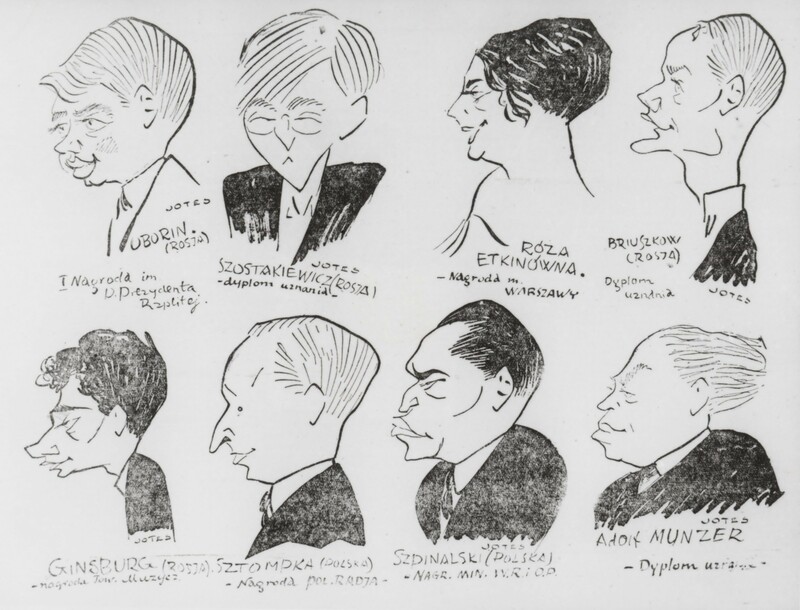 Picture: Caricatures of the prize-winners in the 1st Competition, by Jerzy Szwajcer-Jotes. The effects surpassed all expectations. "The standard of playing was so high – wrote Jaroslaw Iwaszkiewicz, dazzled and transfixed – that the jury found itself with a real dilemma, involuntarily overlooking several excellent musicians. The enormity of the pianistic skills attained in our times by what are virtually children (Goldsand – 16, Oborin – 19!) prompts one to reflect – what's next?" Next… it was increasingly intense, with the Competition’s reputation spreading far and wide. The second edition, in 1932, was already on a significantly larger scale. From the 200 candidates, the international jury selected 93 pianists to perform in the first round, representing a total of 18 countries, this time including from outside Europe, since one of the pianists came from Brazil and two from the United States. 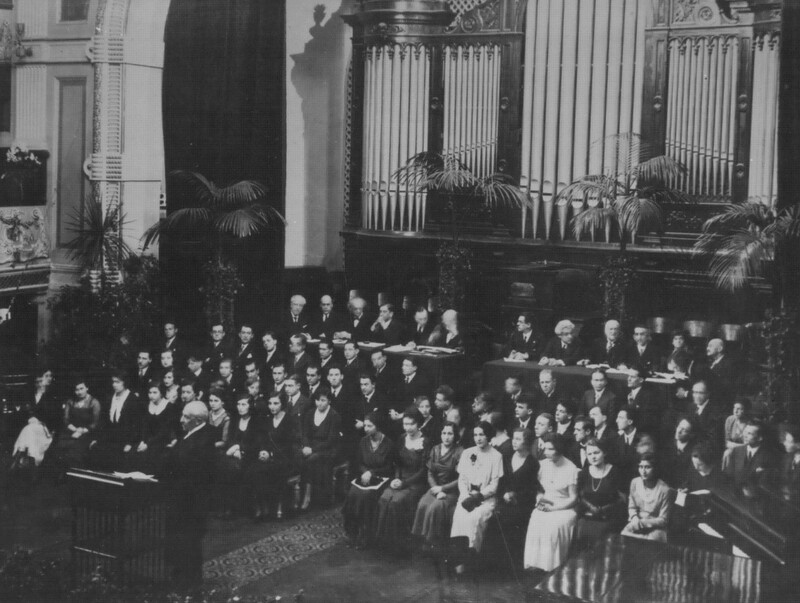 Photo: Inauguration of the 2nd Competition, speech by Włodzimierz Czetwertyński, president of the Warsaw Music Society (1932). After three promising editions (the third was held in 1937), the organising of the Competition was thwarted for more than a decade by the Second World War. The tradition was not resumed until 1949. It was from that moment on that the Competition was held in a regular five-year cycle (the exception being the fifth edition, organised in 1955, due to the rebuilding of the Warsaw Philharmonic following war-time destruction). The competitions in the forties and fifties gradually reached a truly international standard. Already for the Fifth Competition, in 1955, posters were printed in eight different languages, and the demands set before the participants were also increased, with a more difficult programme than in previous years. The impressive line-up of the jury included prize-winners of previous editions, such as Lev Oborin, Yakov Zak and Imre Ungár, as well as one of the most outstanding composers of the twentieth century, Witold Lutoslawski. 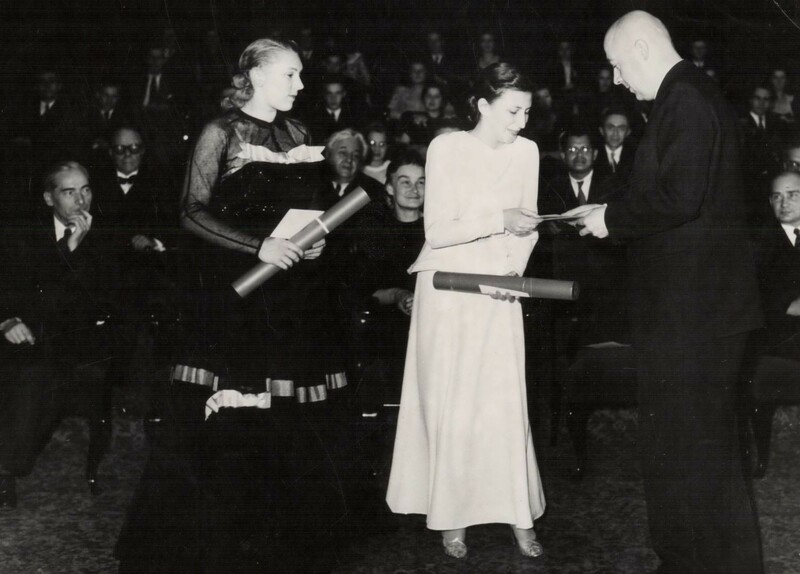 Photo: Prime Minister Józef Cyrankiewicz presents First Prize (equal) to Halina Czerny-Stefańska and Bella Davidovich (1949). 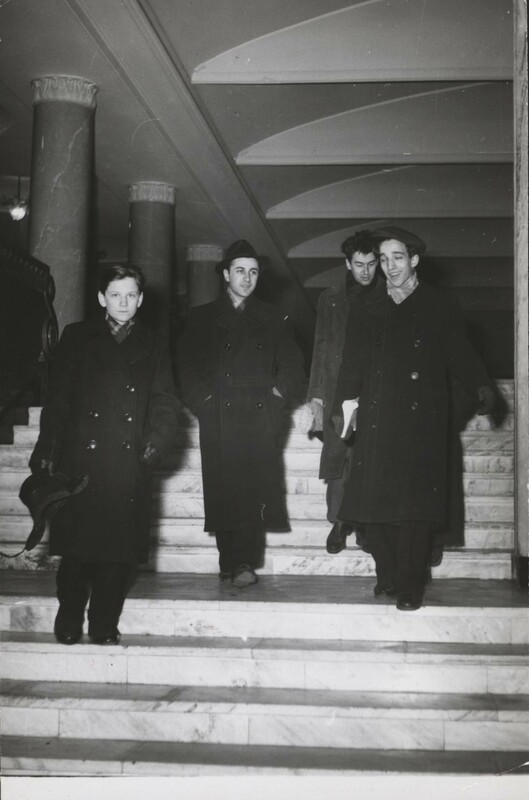 Photo: Competitors at the Warsaw Philharmonic: Dmitry Sakharov, Naum Shtarkman, Adam Harasiewicz, Vladimir Ashkenazy (1955). The sixties and seventies brought a true heyday for the Chopin Competition, confirmed by the names of its brilliant victors – Maurizio Pollini, Martha Argerich and Krystian Zimerman – and by the composition of the jury. From 1965, the jury included Jan Ekier (himself a prize-winner of the third edition in 1937). The doyen of world Chopin studies, Professor Jan Ekier died on 15 August 2014 at the age of 101, having served as a juror of the Chopin Competition continuously for forty-five years, up to 2010. Photo: Deliberations of the jury at the Warsaw Philharmonic. 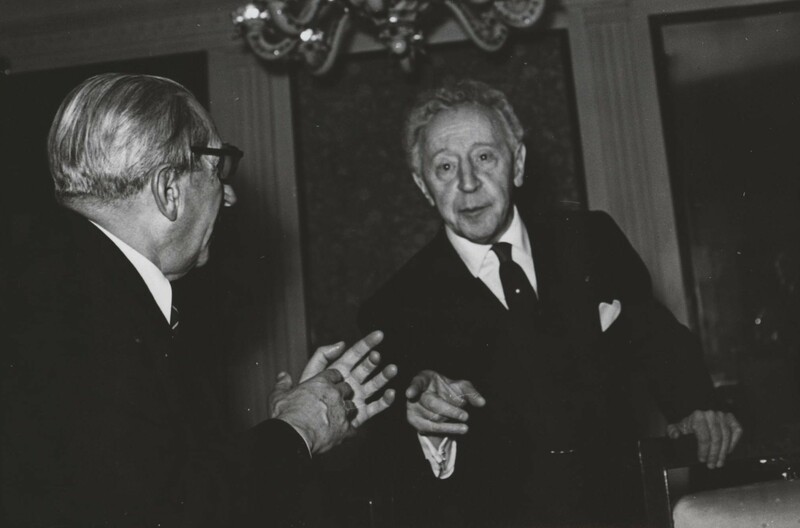 Arthur Rubinstein, honorary chair of the jury, and Zbigniew Drzewiecki, chair (1960). 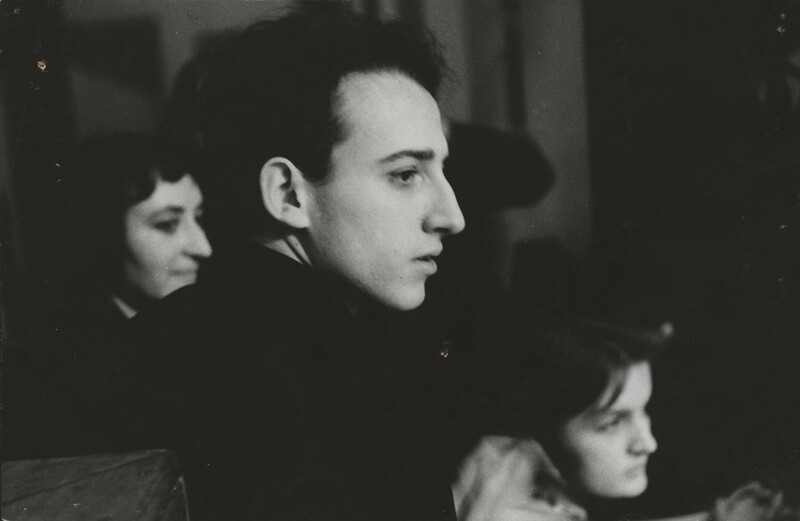 Photo: Maurizio Pollini during the prize-giving ceremony at the Warsaw Philharmonic 12 March 1960. The Seventh Competition earned the nickname "Great", on account of the particularly high standard of playing among the young pianists. And it was in that "Great Competition" that a spectacular victory was carried off by Martha Argerich, defeating the runner-up Arthur Moreira-Lima. Observers were fascinated by Martha; she was ascribed great delicacy and subtlety, but also a strong, fiery temperament. The public called her by the diminutive name "Martita". "In her quick, energetic movements, in her slender, shapely figure, there is something of a weasel about her", recalled Zofia Jezewska. 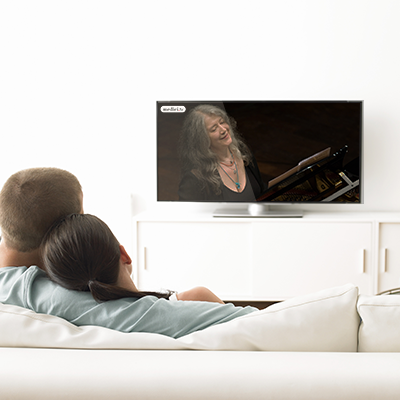 The rivalry between Argerich and Moreira-Lima stirred huge emotions among the critics and the public, and certainly not everyone agreed with the jury’s decisions. Third place went to the excellent Polish pianist Marta Sosinska, who won the hearts of the audience even more by giving bravura performances despite being heavily pregnant. 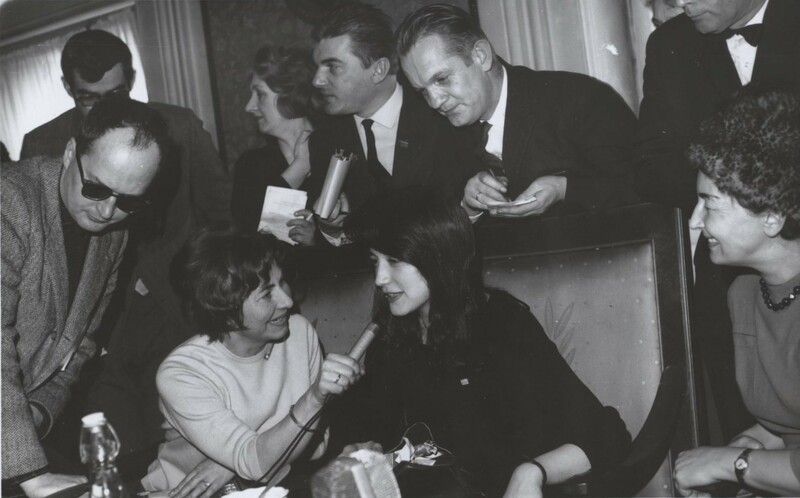 Photo: Martha Argerich gives an interview after the announcement of the results of the Competition; Warsaw, 15 March 1965. The year 1970 proved particularly crucial for American and Japanese pianism, thanks to the victory of Garrick Ohlsson and second place for Mitsuko Uchida. Five years later, the hosts triumphed, with Krystian Zimerman becoming the first Pole to win for twenty years. "The talent of this still eighteen-year-old lad dominated and shone above the abilities of the rest of the international candidates – gushed Jerzy Waldorff. – His playing was characterised by the impetus and joy of youth […]. I was captivated by it […], that is how the young Rubinstein must have played when he began conquering the world with his artistry". 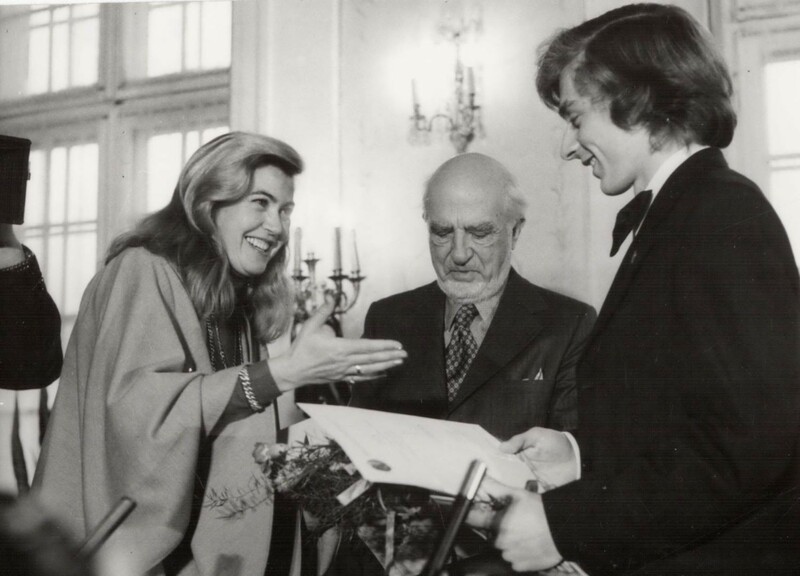 Photo: Barbara and John Seward Johnson present an hors concours prize to First Prize Winner Krystian Zimerman (1975). With time, interest in the Competition and its prestige began surpassing that of all other artistic events connected with Chopin. 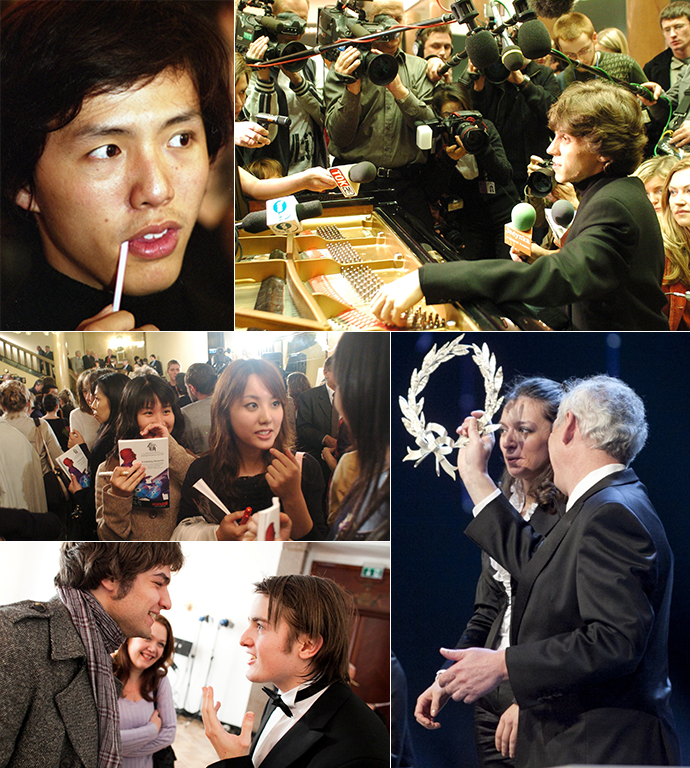 The number of young pianists applying from all the continents of the world became increasingly large. In 1980, the Tenth Competition was won by the wonderful, delicate Vietnamese artist Dang Thai Son. Among the participants, incredibly strong emotions were aroused by the Yugoslavian pianist Ivo Pogorelich, whom the jury (albeit not unanimously, since Martha Argerich even left the jury in protest) did not include among the prize-winners. "If we describe the atmosphere of the Chopin Competition as hot, then it might be said that the last was swelteringly tropical", summed up Tadeusz Kaczynski in Literatura. 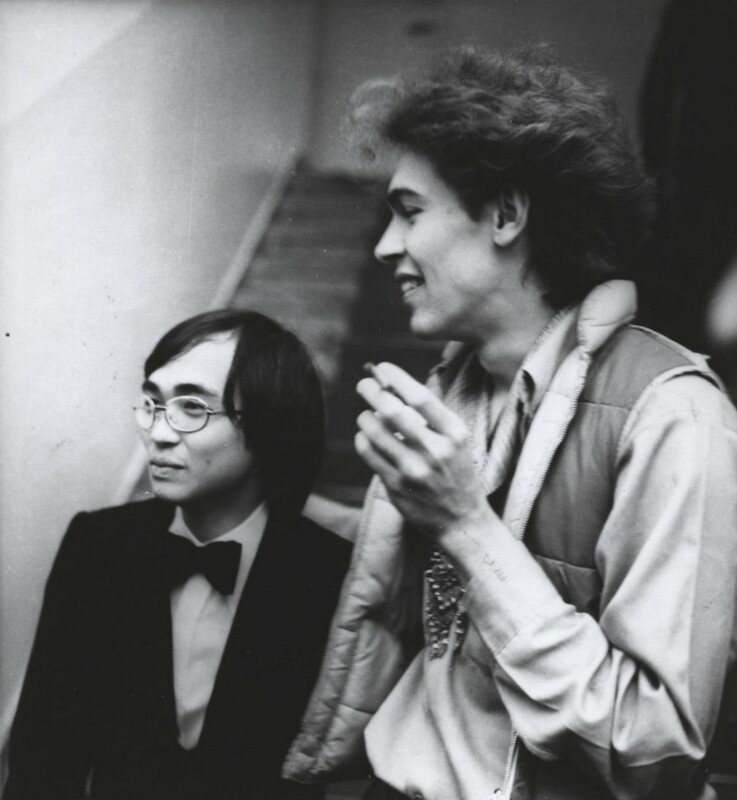 Photo: Dang Thai Son and Ivo Pogorelich during the announcement of the results (1980). That was followed, however, by the poor sequence of the nineties, when in two successive editions the jury failed to find anyone among the candidates deserving of the mantle of victor. In 1990, second prize – the top prize awarded – went to Kevin Kenner, and in 1995 second prize was shared by Philippe Giusiano and Alexey Sultanov. The twenty-first century set the Competition new challenges, in a changing social, cultural and media situation with which not just the organisers, but also the prize-winners had to cope. Both camps are finding their feet in the new circumstances increasingly well. Yundi, the winner in 2000, is a media superstar. The leading lights of the 2005 and 2010 competitions are much sought after: the winner of the Fifteenth Competition, Rafał Blechacz, and the prize-winners of the sixteenth edition, Yulianna Avdeeva, Daniil Trifonov and Ingolf Wunder. The YouTube recordings and Facebook accounts of all these pianists have hundreds of views and subscribers. What achievements will the Competition be able to boast in 2015? Well, we have already had a record number of applicants: more than 450. It is fitting to reiterate the question that Jaroslaw Iwaszkiewicz posed after the First Competition, in 1927. The huge interest created among young pianists by the Competition in our times prompts the reflection: what's next? Photos: Yundi, winner of First Prize, during the announcement of the results of round three, in the foyer of the Warsaw Philharmonic. Photo by Leszek Kubiak (2000) | Rafał Blechacz surrounded by reporters (2005) | Yulianna Avdeeva receives her commemorative wreath (2010) | Lukas Geniušas (Second Prize) and Daniil Trifonov (Third Prize) in 2010.